Rustic Pollock Pines Cabin w/Large Deck Near Lake! 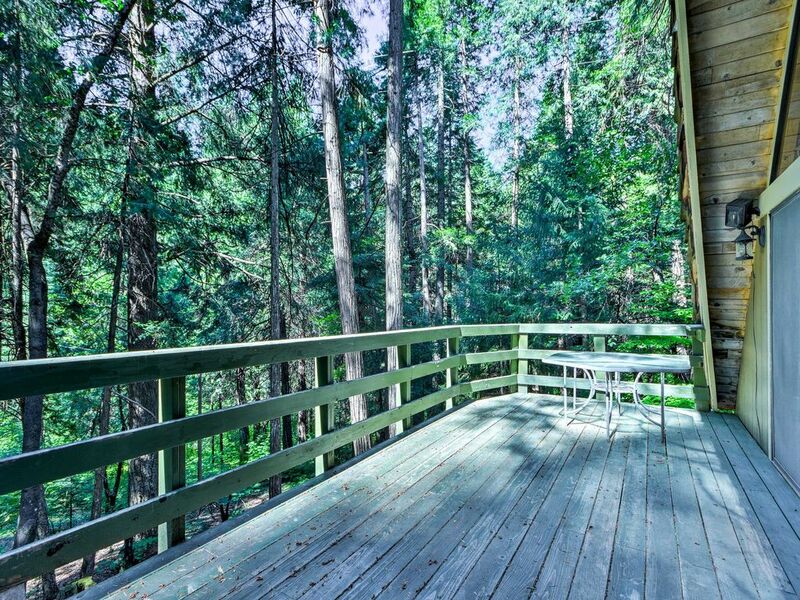 Elevate your next Pollock Pines escape in this 1-bedroom, 1-bathroom vacation rental cabin. Boasting over 1,000 square feet of living space, this cozy A-frame cabin comfortably sleeps 6 and features a spacious back deck. Make yourself at home in your very own tree house, surrounded by magnificent redwoods and towering pine trees. The property is ideally situated only 10 minutes from Jenkinson Lake, 45 minutes to Sierra-at-Tahoe Ski Resort and under an hour from South Lake Tahoe. Step inside to discover your idyllic Pollock Pines getaway. Natural light pours through the large windows that back the main living space and illuminate the custom wood siding that travels across the A-frame ceiling. Prepare your favorite dinners and desserts with ease in the well-equipped kitchen, which features a full size refrigerator, stove cooktop, toaster oven and other basic appliances. Enjoy a hearty breakfast and fresh cup of coffee at the breakfast counter set for 2 while you plan for the day ahead. An adjacent picnic table invites 6 to gather for a family style dinner. Once you are satisfyingly full, relax and reminisce with your travel companions in the living area. The space features comfortable furnishings and a library of books. Make your way towards the bedroom when you’re ready to call it a night. The room includes a plush queen-sized bed and a cozy daybed. The upstairs loft features 2 twin-sized beds for 2 guest to get their best night’s sleep. In the morning, walk out onto the back deck and breath in the fresh mountain air. This lovely outdoor space offers tranquil views of the surrounding forest and hillside. Discover countless outdoor opportunities, such as hiking, mountain biking, horseback riding and fishing, just a few miles away from the cabin. Spend the day swimming in the crystal clear waters of Jenkinson Lake, roughly 4 miles away, and don’t forget your tackle box! Try your hand at fishing to reel in Mackinaw or Rainbow Trout to fry up for dinner. Take a scenic hike or bike ride around the Fleming Meadow Trail, a 9 mile route that takes you around the lake. To view the spectacular Park Creek Waterfall, enter through Hazel Creek Meadow and embark on a 1 mile hike across the footbridge. For those traveling in the colder months, Sierra-at-Tahoe Ski Resort lies only 45 minutes away, where you can ski and board down well-groomed trails. Explore the bustling city of Sacramento when you need a change of pace, situated an hour away from the cabin. Here, you will find a variety of landmarks and parks, along with other must-see sites such as the Tower Bridge and the California State Railroad Museum. For a romantic evening and an exquisite wine list, visit Honey Bear Ranch Winery & Cafe, located only 12 minutes away. For a more casual eatery, check out C & T’s Restaurant, Burger Barn or Pizza Factory nearby. - Amenities include a well-equipped kitchen, coffeemaker, front and back deck, outdoor furniture, fire pit and more! Miserable to get into, very nice inside. It took us 40 minutes to shovel the path leading to the cabin, four of us working on it at once. The hatchet worked well on getting the two feet of snow/ice to chip so another of us could shovel it out of the way. We also had to move snow to get the cars in. Once we got into the cabin and warm and dry, it was really nice. I had specifically asked if we could get in because I’m 76 and my husband had had back surgery. I was assured if there was any difficulty it would be mentioned on the web site. I had emailed as instructed and no one got back to me so called and left a voicemail, then called the other number. I’d recommend this cute cabin fo summer stay, but suggest you warn people that they have to shovel the very steep path down to the cabin in the winter time. A half foot of snow fell the night before our three night stay at the cabin. It was VERY cold when we arrived, 40 degrees in the cabin! There is a small woodstove and a few baseboard heaters that took a LONG time to heat the place. It never got above 60 degrees inside the entire time we were there. Wood was provided, but it was wet, so we ended up buying some at Safeway. We were expecting cold weather & brought cozy clothes, luckily! There were ample blankets & throws available. The cabin is pretty dated & basic, but pretty much all we needed was provided...with the exception of a decent coffee pot. We couldn't figure out how to watch movies. The TV remote seemed to be missing. It was very quiet and peaceful & we enjoyed the view off the back deck of the beautiful wooded hillside. I feel this cabin is better suited for a warm weather stay & would probably stay again in the future! We loved this A frame cabin! My family and I had such a great weekend staying in this sweet A frame cabin. My kids loved the loft full of games and stuffed animals! Jen was so sweet and helpful! We hope to be back here many more times! Whimsical Cabin in the wood! This is the perfect storybook cabin, our son 7y, loved it and he especially enjoyed the loft. The deck overlooking the woods is peaceful and quiet. It’s conveniently located near showing centers, restaurants, and parks/camp grounds. Very cute and quiet treehouse like cabin. We rented this cabin for our honeymoon. We absolutely loved it. Lots of Native American history and artifacts. They have a wide variety of books new and old. Lots of games and outside activities.The kitchen is stocked with pots, pans, utensils, plates, cups and even two coffee makers. The view off the deck is stunning with redwoods, sequoia's, white flower dogwood trees everywhere. If you are looking for a quiet treehouse a frame cabin in the woods we would highly recommend this place. We loved it here and definitely will be back.